Time to Restore your Pool? At Sweet Pool Restorations, we pride ourselves on using only the finest materials and workmanship to ensure quality results for decades. The project begins with an extremely thorough demolition. This involves the removal of old tile, coping, unsound plaster and any deteriorated, cracked or otherwise unstable concrete from the structure of the pool shell. In the case that skimmers, jets, or other plumbing orifices and pipe works are to be changed or repaired, this will be done at this stage. If the project calls for the addition of water-features such as spill-over spas, sheer decent or natural rock waterfalls, the foundation and plumbing works for these will then be installed. We then begin to prepare the pool shell for new finishes. 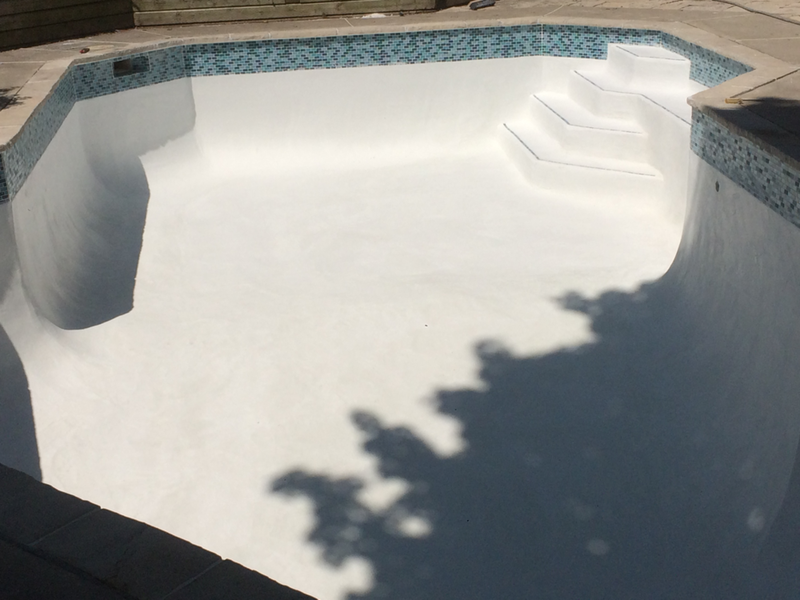 The first stage in this phase is to thoroughly clean the bond beam (top edge of pool) and pool surface by means of chipping, acid washing and power-washing, and in some cases, sandblasting or grinding (Typically only required if the pool has previously been painted). Only when the deteriorated bond beam is free from unsound material and meticulously cleaned, are we ready to begin re-building this top edge to a level surface, ready for new tile and coping finishes. This is done by the application of a fast setting, acrylic-modified bonding mortar that is both water tight and contains a corrosion inhibitor, which reduces any rust staining concerns from exposed re-bar. Once the beam is true and level, we can begin installation of the new coping, of which many options are available. Once the coping is installed, grouted and sealed (where applicable), the waterline, step and break-off tiles are installed. Landscape and/or pool deck work will be completed at this time, as the coping will set the grade requirements -- and landscaping makes a quick mess of a pool full of fresh water! The pool is now ready for the final preparation work. We carefully acid wash and pressure wash the entire pool surface before applying a scratch coat. The scratch coat is a textured layer of cement and acrylic binding agents that the new plaster material will adhere to. A proper scratch coat applied to a properly cleaned shell is crucial to ensuring a good bond. The shell is now ready to be plastered (also known as marbleized or marcited). The material is applied by hand with trowels to a uniform thickness of approximately 3/8".